The above word is the nickname of the city of Baltimore, but it might as well be a nickname for “bummer,” as the Orioles have resembled the stinkiest of the stinky when it comes to baseball. I’ve only lived in one baseball town in my life (as New Orleans only afforded me with the Zephyrs – giving me the chance to scout one Lance Berkman back when he was a nobody). Living in Baltimore provided me with a unique perspective, especially as a waiter on the Inner Harbor. As a server, by virtue of actual Baltimoreans being lousy tippers, I always rooted for the opposing team to win, giving way for the out-of-towners to come in, get drunk and tip me big, as long as I professed my love for their team. More often than not, opposing teams wouldn’t let me down, and odds are favorable for repetition again this season. I can’t really knock Hernandez. His performance has been relatively stable over the last five years, if not for a trip to the 15-day DL with a bruised groin, courtesy of a foul tip off Seattle’s Ben Broussard. He turns 32 in May, and chances are Hernandez will make it through the entire season, but his days are numbered. Minor Note: Keep an eye out for Matt Wieters, as this Georgia Tech alum is being hailed by Scout.com as the best catching prospect in all of baseball. His obvious downside is his representation, super-hawk Scott Boras, but Wieters, as a 6’5” switch-hitting catcher is perfectly capable of hitting .300 with 30 homers and a lot of walks. I’m just saying. Keep a look out. Don’t be surprised if this becomes Millar’s last season with the Orioles. Batting cleanup this upcoming season, Millar was only guaranteed a contract extension for this year by appearing at the plate 475 times. For the major leagues, Millar can be described as solid. For the Orioles, however, he’s amazing. One of two shining stars on this squad, Brian Roberts has proven to be the truth, and then some, at second base. His 42 doubles, 50 stolen bases, 89/99 BB/K ratio, and 268 total bases mean that there’s no knocking to be done here. His back has been sore throughout the spring, however, so look for a stagnant performance until about mid-May. After raising more eyebrows in 2004 than anyone watching Stephen Curry this year in the NCAA Tournament (by the way, if you don’t know, Google Stephen Curry), Melvin Mora’s performance has dropped off. He probably won’t ever come close to his 2004 membership into the 3-4-5 club, when he batted .340 with 20 HR and 104 RBI. But in an interview, Mora said, “I never think about hitting home runs. When you try to hit home runs, you know what happens? You miss the ball. I try to hit line drives, but I know my power is going to pick up because I feel good. I think I’m going to hit 20-25.” Frankly, he’ll be lucky to hit 15. After five straight seasons without missing a game, Miguel Tejada was mercy-traded to the Houston Astros the day before his mention in the Mitchell Report. Without Tejada, the Orioles are left with 27-year-old Brandon Fahey and 23-year-old Luis Hernandez. All you need to know: Fahey had 11 errors in 75 games last season for the Triple-A Norfolk Tides, while Luis Hernandez is 23, without the fortune of being named ‘Cabrera.’ Bahmer. In his third season with the O’s, Markakis has “stud” written all over him, and is a presumptive candidate for the “That’s My Dawg Award” this season. 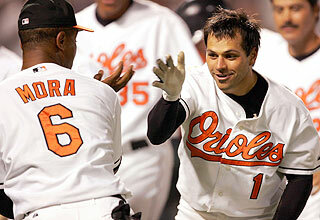 He lit up Camden Yards, and my fantasy team, to the tune of .300, 23 homers, 112 RBI, and 191 hits. Markakis will be joined by Scott, a soon-to-be 30-year-old with solid defense and even solider contact. Adam Jones is the wild card, with explosive power and explosiver whiff potential, making him literally hit-or-miss for the year. Was it really so long ago when Huff was the best player on the Tampa Bay Devil Rays? He probably wouldn’t even merit a starting spot on their 2008 squad. Huff still hits well enough to hold his weight at the hot corner, bust as a designated hitter, he’s a disaster. Of course, at third base, he’d likely prove a disaster on defense, at this point. Most of the Orioles’ starters look like bench players, so it’s no surprise to see a weak group here. Gibbons, the biggest name of the group, may need to serve a 15-game suspension, and there are whispers that he may be waived either way. Bynum, who played in 70 games last year but only came to the plate 101 times, begins the year on the DL. Former first round pick Scott Moore is a nice pick to surprise after posting an .899 OPS in Iowa last year, but overall, the depth on this team is pathetic. The departure of Erik Bedard has hit the Orioles hard. Erik Bedard was the equivalent of receiving a sweater on Christmas morning: you knew it would keep you warm, but what you really wanted was a leather jacket, as they look cooler and keep you warmer. The sweater gets sent to someone in Seattle who really needs it, and its worth is fully realized, while you ponder what could have been as you fiddle with your Legos. My point is: Whenever Steve Trachsel is your “dependable veteran,” you need work. Closer Chris Ray is out for the season. Danys Baez is out for the season. Fernando Cabrera might be out for the season. The O’s closing hopes lie in the George Sherrill, a 31-year-old from Seattle who has been a workhorse, appearing in 145 games in the last two seasons. He will add to the durability of Jamie Walker, who posted a 3.23 ERA in 81 appearances last season. Dennis Sarfate allowed 1 run in 8.3 IP, while Matt Albers will move to the bullpen after a disastrous 4-11 record with the Houston Astros last year. Prepare to sigh. Painfully, I might add. Outlook for the Season - It’s never easy to play at least 35 combined games every year against the Boston Red Sox and the New York Yankees. The only hope for the Orioles this season is to abandon the city in the middle of the night, ala Baltimore Colts, and book it to Oregon, where they can re-invent themselves as the Portland Peacekeepers, making the AL West a lot more interesting. The team shows promise, but as always, that promise will lead them to the bottom of the standings.